Today, I logged in my Discover account, and I felt something unfamiliar on the page. There are three lines in 5% Cashback Bonus section. One is “Gas Station”, which is 3rd quarter of rotating category. The other one is “Online Shopping and Department Store”, which is 4th quarter. And there is another one between these two. It was telling me to activate now. I clicked and got to know a new special offer. The time-frame overlaps with 4th quarter’s rotating category a little, but they are different offers. You need to choose one among the following stores, Applebee’s, Olive Garden, Bed Bath and Beyond, Shell, Lowes, and Walgreen. Applebee’s and Olive Garden – I don’t often go. I’m definitely not going to spend $1000 there. 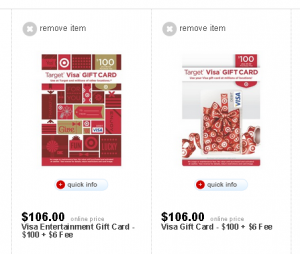 Lowes and Walgreen – You can find their stores gift cards with around 10% discount. 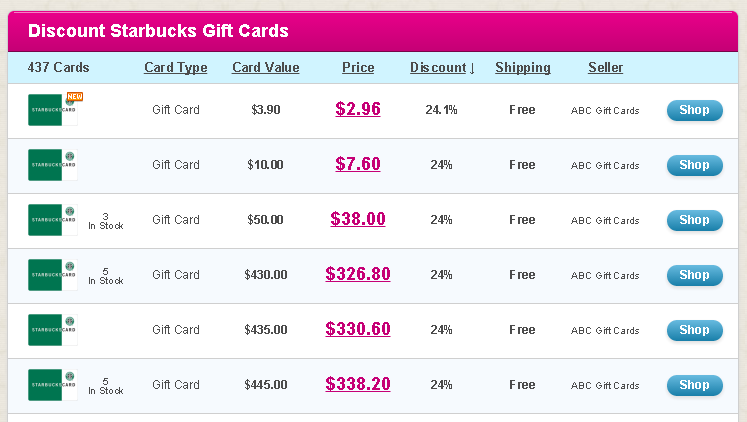 If you buy merchandises in these stores, getting discounted gift card can save more. However, they sell other stores gift cards. Especially, Walgreen has $500 ($20-$500 variable amount) Vanilla Visa gift cards, and the selection of gift cards is much better than Lowes. So, I chose Walgreen and activated the offer. I have three credit cards with rotating category, Chase freedom, Citi dividend, and Discover it. Go shopping at department stores with Chase freedom, at Bestbuy with Citi dividend, at Walgreen and online shopping with Discover it card. I will be really busy the following months. Moosejaw was founded in 1992 in Keego Harbor, Michigan. They sell outdoor clothes and gears. Since there are no local stores in the area I live (NY), I shop online. I have been a customer for more than three years and made many purchases. 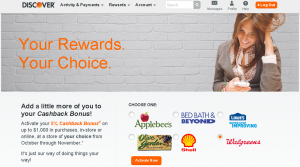 The reason I keep coming back and shop is its great loyalty rewards program, Moosejaw Rewards. You can earn 10 points for every dollar you spend, (except for gift cards and 5 points for sales items). 1 points is worth 1 cent. 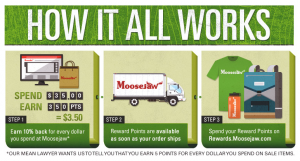 Reward points can be redeemed at “rewards.moosejaw.com”. Probably, there are a little fewer items for rewards redemption than a regular online store, but they have many items from major brand. I believe you can find what you want in Moosejaw Rewards. If you spend $500 today, you don’t only earn 5000 points, but also obtain the first VIP status, “Aconcagua.” From your next purchase, you will earn 12.5 points for every dollar. In Moosejaw Rewards, VIP program is called “High Altitude Bonus”, and there are four VIP statuses. The highest mountain VIP status is “Everest.” 100% bonus means you will earn 20 point for every dollar you spend. Again, 1 point=1 cent, thus you get 20% back! VIP status you earn will be valid until the end of the next year. 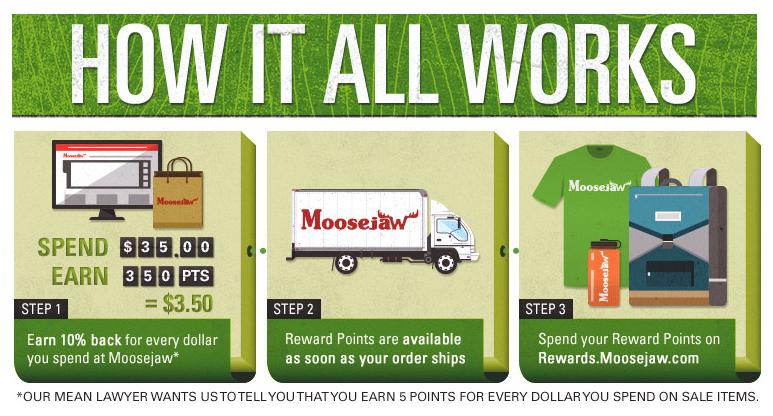 A great offer which Moosejaw gives is not only the rewards program but also many useful coupons. One of coupons I use every time it’s available is “3XREWARD.”(it is available several times throughout the year) Literally, you can earn 3x reward points. Say, you are in VIP status “Aconcague” and make a purchase of $500. You earn 5000*3 and 25% bonus of 1250, 16250 points in total. Even if this is the first purchase of the year, you will earn VIP status of “K2″ with only one transaction! Moosejaw pays good cash back to shopping portals. The best rate is ShopDiscover 10%. During ShopDiscover’s promotion, the rate goes up 15%! 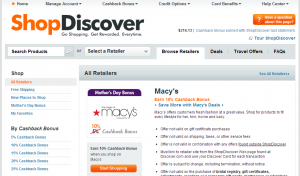 If you don’t have Discover credit cards and can’t access to ShopDiscover, visit ActiveJunky.com. 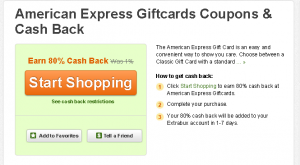 It is a free-to-join shopping portal and offers between 7% to 9% cash back. It is more than 50% off deal! Basic Moosejaw Rewards (10% back) is already great. Plus, you can get VIP Status to earn more reward points. And obtaining VIP status is easy with “3XREWARD” coupon. 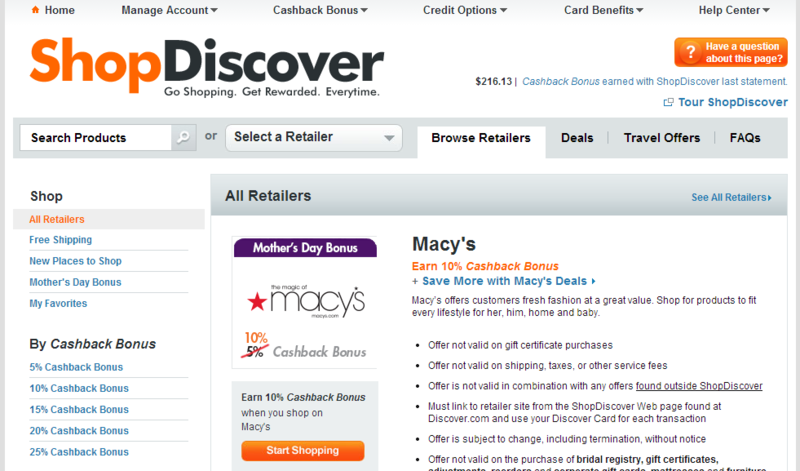 ShopDiscover pays 10% cash back, and I have never had a problem with it. The “3XREWARD” coupon is available quite often. You can check currently available coupons below. I received email that tells Plink shut down. Nothing lasts forever, but my concern (probably all Plink users’ concern) is what happens to points we had. I sent email about it, and I received the following message in a second. Thank you for contacting Plink. We are sorry, but no more points can be redeemed. Plink was officially closed on Sept 11, 2014. Unfortunately, no staff remains to answer emails. It seems that it is an automated email. I’m very disappointed. The last email and their current website say “Any further questions can be directed to support@plink.com. “, but they had no intention to give a costumer support. All they did was set up an automated answering email. I was a new member of Plink. I had 4900 points when they shut down, and that was my lifetime points. I had never redeemed the points. 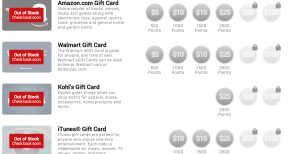 I wanted to see what would happen when I earned more than 5000 points and how many points they needed for $50 or $100 gift cards. 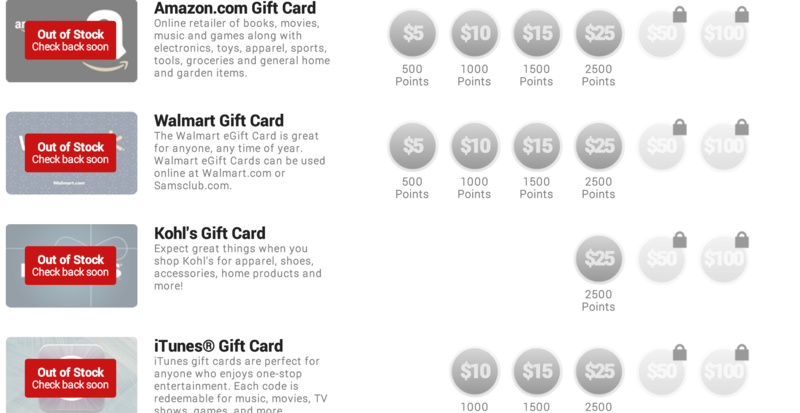 I was expecting that I could get some discount such as 4750 points for $50 gift card, but when my points reached 4900, $50 gift card stayed unlocked (not redeemable). So, at this time I learned there was no discount. It might have had, but it would have been less than 100 points ($1). It was not much worth, so I decided that I would redeem the point when my points got over 5000. However, they haven’t posted points since August 15th. I made five transactions at Advance Auto Parts since then. It was worth 2000 points. Plus, Plink was even offering a promotion last month, which you could earn extra 25% bonus points for Advance Auto Parts purchases. Some transactions were made during this promotion. As I said earlier, nothing lasts forever. But when things went bad, they could have done something such as sending a notice, instead of shutting down all of a sudden. What I’m angry about is that they were offering a promotion in the last minutes! At least, it gives me a lesson. It is better to redeem off as soon as it gets available in case of a sudden closure. 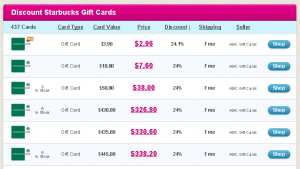 Starting with a similar program, ShopKick, you can redeem for a gift card in as little as $2 increment. And Chime Card, (it is totally different reward program.) The new rule will be implemented on Oct 8th. 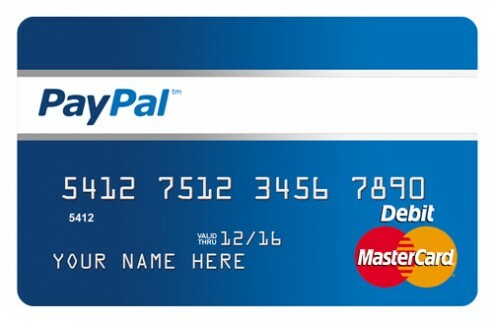 They will probably start charging a fee to load Chime with PayPal debit card. I have been using the card without a problem, but new offers haven’t been added this week. What is going to happened to this program? On Sep 2nd, I made AmEx GC purchase through “Simply Best Coupons”, which offers 1% cash back and a promo code to waive a purchase fee. Since then, Simply Best Coupons had been the best portal for AmEx GC purchase, but that has been gone, too. All you can find in the website is a promo code that waives a purchase fee. Here are the today’s screenshots of Cashbackholic.com and Cashbackmonitor.com. There are much fewer portals, and most of them are not famous or reputable sites. 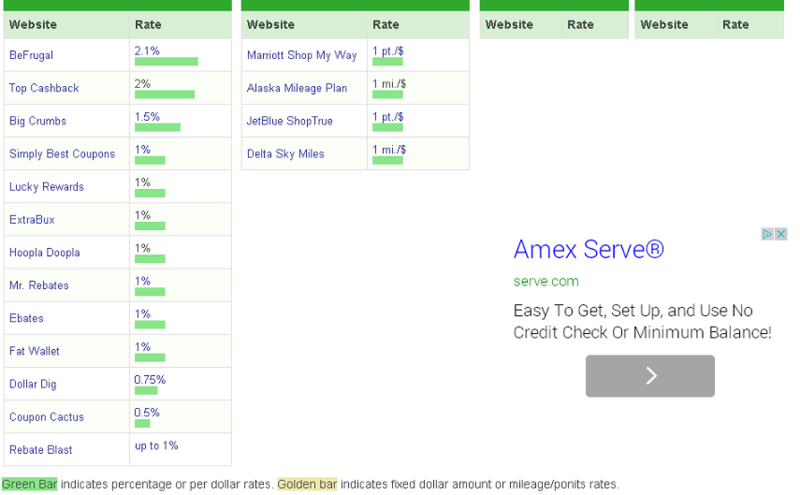 The picture on the right is the page of AmEx GC at ExtraBux.com. This is obviously an error. 80% cash back is just impossible! It seems that AmEx GC deal has been dead, and $99 I paid for Premium Shipping Plan just a few month ago will be wasted until the deal is back. It may not be going to be back forever, though. 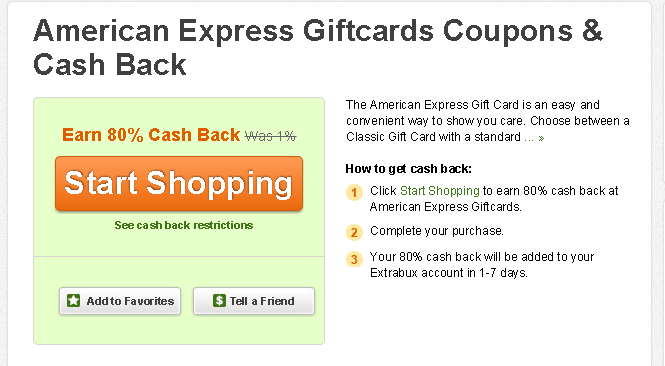 I was using AmEx GCs for purchases where my credit cards doesn’t offer bonus cash back. For example, Costco. The only AmEx credit card I have is Blue Cash Preferred. Since Costco is not in “Grocery Stores” category but “Wholesale Clubs”category, there is no bonus. Cash back from Blue Cash Preferred is only 1%. And cash back at grocery stores is 1%, anyway because I have already spent $6000 at grocery stores this year. 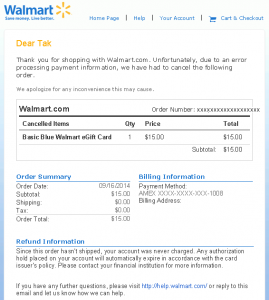 AmEx GC purchased through the portals had given me around 2% to 4% discount. I can’t find a way to get 4% discount, but around 2% is easily obtained in the other ways. Here are some ways I came up with. 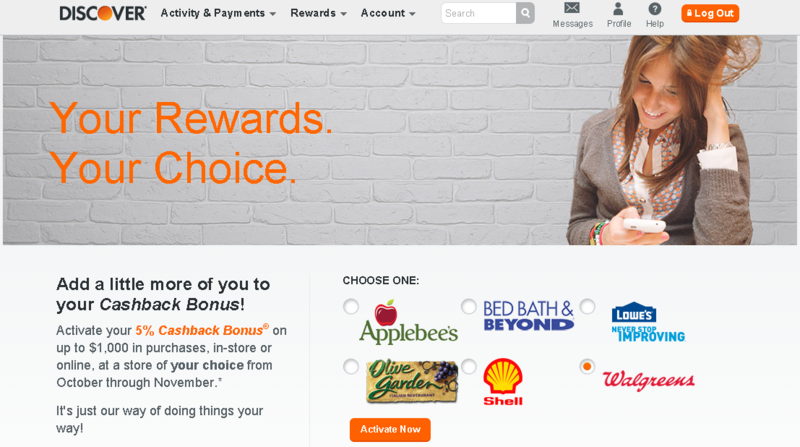 Earn 1% cash back when you purchase, and another 1% when you pay the bill. It is simply 2% cash back on all purchases. Since Citi Double Cash is not AmEx (Visa or MasterCard, not sure which one), I can’t use at Costco warehouses, but I can use it online to buy a Costco gift card and use it in warehouses. Another 2%-cash-back credit card. 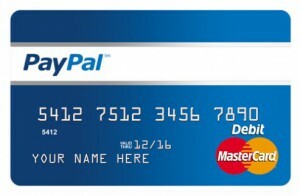 Since this card is AmEx, I can use it directly in Costco warehouses. I have never done this before, and it is not verified. According to Visa Supplier Locator, Target is categorized as Grocery Stores. 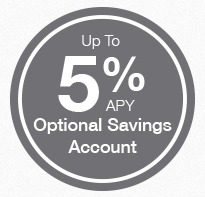 Using Visa credit cards such as “US Bank Cash+” and “BankAmericard Cash Rewards” (both cards offer 2% cash back on grocery purchases) to load AmEx for Target may give you 2% cash back. 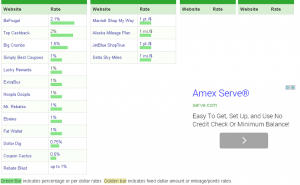 As a rule of AmEx for Target, the maximum amount per load is $1000, and it is charged $3. 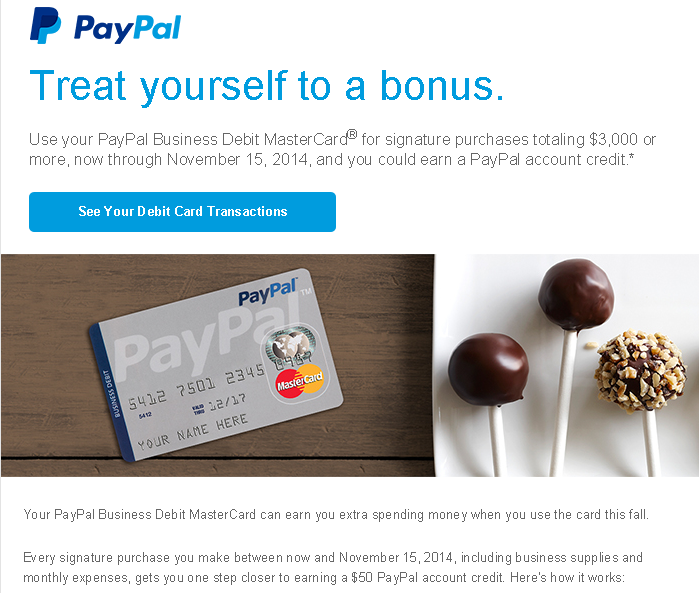 If the transaction is eligible for 2% cash back, you will earn $20-$3=$17 each load. So, you get 1.7%-discounted AmEx prepaid card. 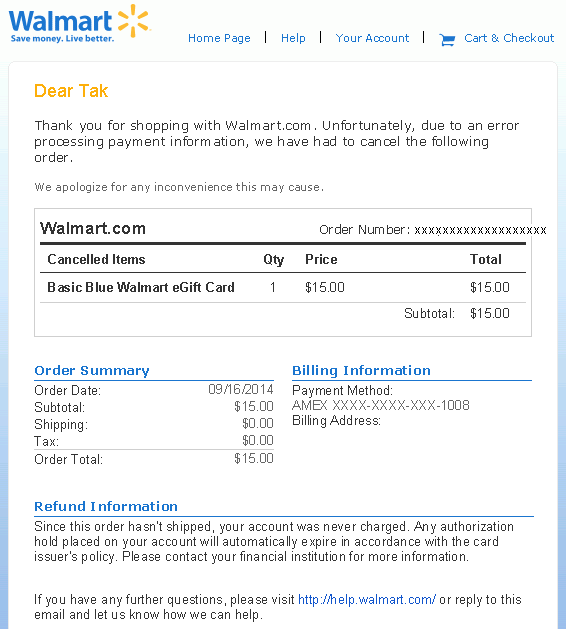 This doesn’t work AmEx Blue Cash cards. That is because AmEx doesn’t consider Target as “Grocery Stores”, but “Superstores”. It is clearly stated in their website. Currently, I don’t have any of these credit cards. Now that AmEx GCs deal is dead, I definitely need one of them, especially “Citi Double Cash Card” or “Fidelity Investment Rewards American Express Card”. After doing some more research, I will apply at least one of them.